Scale and mail gauntlets and mittens - mail armor by Steel Mastery. This section contains different models of the scale and mail gauntlets for hand protection. All goods are handcrafted by individual customer’s parameters. These gauntlets and mittens are based on the paintings from old manuscripts. If you have any difficulties while choosing, please contact our manager and we will help you. 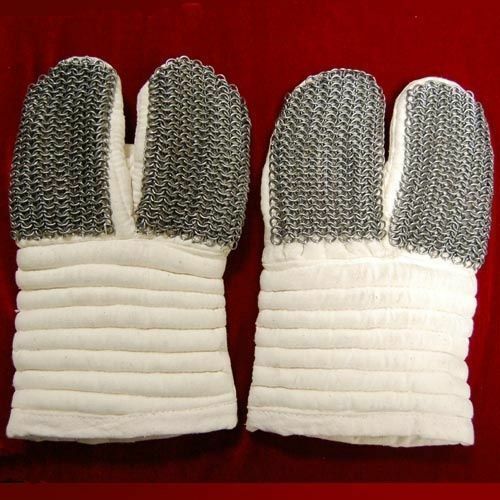 Mail mittens or gauntlets from this section are perfect for participation in the tournaments of medieval fencing, historical festivals, buhurts and reenactment events. Depending on the complement, such defense is compliant to the standards and rules of such social movements, as SCA (The Society for Creative Anachronism), HEMA (Historical European Martial Arts), HMB (Historical medieval battles). It is likely, that mail gauntlets did not have common usage in Medieval Europe. Historians guess, that it was related to general opinion, that hands were considered as not important target those days. As a rule, enemy aimed at the chest, belly or head, trying to hurt as much as possible. Moreover, it was impossible to do archery with such gauntlets – they just hindered the fingers movements. Anyway, there are evidences of existing of mail protection for hands. For example, it is known, that warriors were using mail gauntlets, which consisted of two sections: for thumb and for other four fingers. This armour for hands was making a whole with sleeve (as we can see on the silver shrine of Charles the Great (Aachem, Germany). Such gauntlets were called mufflers. String over the wrist did not allow heavy gauntlets slipping down the hand. When there were no longer any necessity in protection, hand could be passed through the cat in the inside part of muffler. So, mitten was hanging down after the manner of child mittens. You can see the earliest paintings of separate gauntlets with long wristbands on the pictures in “Chronica Majora” and “Historia anglorum, or Historia minor” by Matthew the Parisian (about 1250 year, Cambridge, UK). This hand protection consisted of thick padded base with mail pieces sewn on it. Sometimes hand defense was reinforced with metal plates on the back of hand. Cut of mail armour could be two-fingered, where thumb was set against four fingers. Gauntlets with big segment divided on two parts had appeared approximately in the middle of the XIII century. Pointer and middle finger were separated from ring and little fingers now. Strength of grip of sword’s handle could differ. Fingers were tensing less and thereby hand got tired not too fast. Moreover, it’s became handier to hold heavy shield with such gauntlet.